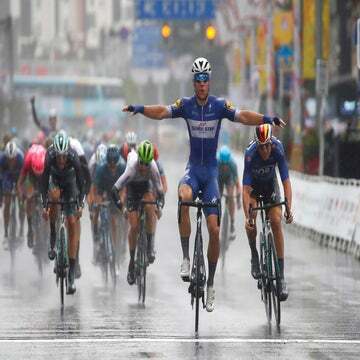 The 22-year-old Quick-Step Floors rider earned his team's 72nd win of the 2018 season at the Chinese stage race. Fabio Jakobsen snagged the 72nd season victory for Quick-Step Floors at the Tour of Guangxi on Thursday. Jakobsen won stage 3 of the six-day race in a sprint thanks to a well-timed move off his competitors’ wheels at the end of the 125-kilometer route. Pascal Ackermann (Bora-Hansgrohe) and Max Walscheid (Team Sunweb) placed second and third. The win put Jakobsen into the overall lead, as he now holds a 4-second advantage over Ackermann and a 6-second edge over Dylan Groenewegen (LottoNL-Jumbo). This is the 22-year-old Jakobsen’s first year in the WorldTour, and he has made it count with six victories — four stage wins and triumphs at Scheldeprijs and Nokere Koerse. The Tour of Guangxi resumes Friday with stage 4, a 152km route from Nanning to Nongla.